Now it is time to open up the imagination a bit more than we have in previous Letters. 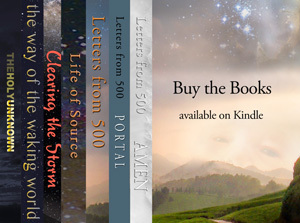 It is true that “Letters from 500” asks us to put aside our judgments of time and space and go with the inner knowledge of all that is. If we quiet our mind, just for a brief period, we can enjoy The Knowing that is our birthright. The veil that exists, between what we think is real and what is beyond that state of realness, can be dissolved so as to see beyond, into the all evolving Source. We have been given the great gift of imagination. This gift allows us to peer into realms beyond belief. We must trust this gift and use it to expand our vision. There is so much more than we believe exists and the door to this world is through our beautiful gift that Source has given us. With this said, over the next week I am posting segments from Homo Angelicus. So open in, smile and enjoy the read. One of the best letters yet! Thanks. And very appropriate too, given the current state of things in the world.